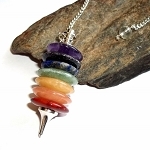 Large seven chakras wand set in a silver plated pendant. The stones are amethyst, blue aventurine, lapis, green aventurine, yellow aventurine, peach aventurine, and red jasper. Overall drop length approximately 2 1/2 inches. Please do not wear in water. The stones are bonded together and water can break down the bonding over time.